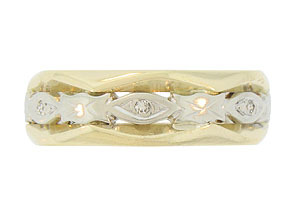 This unique vintage 14K bi-color wedding band features a central ribbon of white gold. Alternating diamond set marquis and abstract florals dance across the center of the ring. 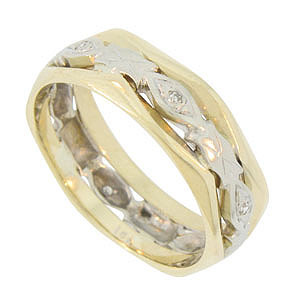 The white gold florals are pressed between octagonal shaped yellow gold bands. The Retro Modern wedding ring measures 6.65 mm in width. Circa: 1940. Size 8. We cannot re-size.